What is the most important policy issue facing today’s young people? Climate change might not seem like an obvious contender, as it feels so distant. Indeed, the majority of impacts from global warming have yet to come. But the magnitude and extent of those impacts are being determined right now. Only today’s young people will still be around to witness the effects of today’s actions. Many people see climate change as just another environmental issue that will only impact the polar bears and coral reefs. In fact, it’s far more wide-reaching than that. An increase of only a few degrees in average global temperature will affect human systems of all kinds: agriculture, public health, economics, and infrastructure, just to name a few. However, the future is still quite malleable. Two degrees of warming is bad, but five degrees is far worse, and the difference between the two ends of the spectrum will depend on what we decide to do about the problem. Since our emissions of greenhouse gases, especially carbon dioxide, are causing global warming, the solution is self-evident: cut our emissions, as quickly as we can reasonably do so. Implementing this solution is not so simple, as fossil fuels are currently highly integrated into the global economy. Luckily, free-market mechanisms exist which alter the price signals of fossil fuels to better reflect the damage they cause. A revenue-neutral carbon tax, which is offset by reductions in income taxes or paid back evenly to the public as a dividend, is one solution; a cap-and-trade program, which treats carbon emissions like a currency, is another. While virtually nothing has been done in North America to cut emissions, the rest of the developed world has made a pretty good start. Here in North America, the outlook for action is somewhat bleak. In the United States, says Schmidt, many people “perceive the science itself – just describing what’s going on and why – as a threat to their interests…they choose to attack the science and they choose to attack the scientists.” The Republican Party has adopted this strategy of denial, to the point where top presidential candidates such as Michelle Bachmann and Rick Perry truly believe that climate change is a hoax scientists cooked up to get grant money. The Democrats largely accept the science, but after nearly a full term in office, President Barack Obama hasn’t made any progress on the cap-and-trade program he promised upon his election. In Canada, Prime Minister Stephen Harper has repeatedly said that he will follow whatever actions the United States takes, or does not take, on climate change policy. What decision, then, will we make? Will we get our act together in time to keep the warming at a tolerable level? Or will we choose to let it spiral out of control? Will future societies look back on us with resentment, or with admiration? Remember, you and I are part of those future societies. But we are also part of today’s. Thousands of years from now, it won’t matter what the US deficit was in 2011, or which nations went to war with each other, or how much we invested in higher education. These issues matter a great deal to people today, but they are very transient, like many aspects of human systems. Climate change, though, will alter the earth on a geological timescale. It will take the planet around one hundred thousand years to undo what we are doing. We are leaving behind a very unfortunate legacy to the entirety of future human civilization, and all life on Earth – a legacy that is being shaped as you read this; a legacy that we could largely avoid if we chose to. This entry was posted in Mitigation and Policy and tagged agriculture, bachmann, canada, cap and trade, carbon tax, climate change, economy, geology, global warming, harper, obama, perry, policy, science, sea level rise, united states, youth by climatesight. Bookmark the permalink. Excellent article, but Climate Change would have more impact on Young People if it seriously degraded the quality of their video games. Bachmann, maybe, but I’m not convinced that Perry “truly” believes this. I think there’s a very good chance that he’s fully aware that he’s just pandering (foolishly, I might add) to the most extreme members of his party. Superb collection for younger audiences. I believe that the transient issues that you have trivialised will dwarf the climate issues in the near future. You are not watching the news. That is not to say there will not be major weather events and natural disasters, but humans will prove they cannot get along. This article captures perfectly (1) my motivation and (2) my dilema. (1). After messing about trying to pretend I was good at business for a decade or two, I have finally come to my senses and am trying to pursue a career in policy, lobbying, or advocacy (to try and get us humans collectively to do the right thing) in the hope that the legacy I leave to my children (as will we all) is not as bad as might otherwise be. (2). Despite the fact that they seem more than a little bemused by my sudden change in vocation (I think their mother tells them I have had – or am having a midlife crisis), I am reluctant to explain all this to them lest they have nightmares. I guess I am waiting and hoping for their schoolteachers to do this for me. Thank goodness I live in the UK where ideologically-blinded neo-conservatives are not now trying to ban the teaching of global warming (along with other deeply-subversive notions such as evolution). May God help (and forgive) us all if Bachmann or Perry actually make it to the White House. Bachmann and Perry are very intelligent people, as are all the Republican candidates. They all understand and believe the perils of Climate Change; so whey do they deny? Because we deny! Ridiculous, you say. But it is true. 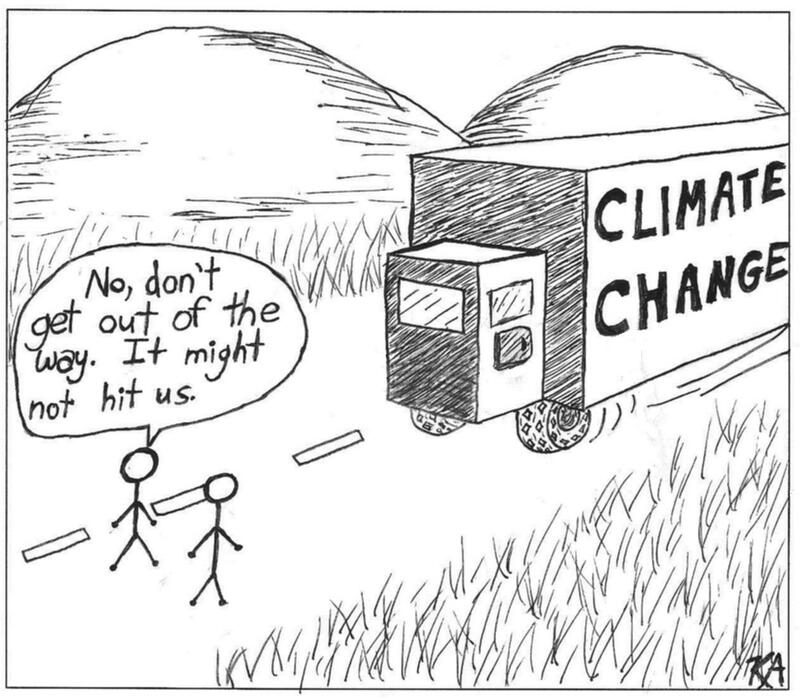 We talk, talk, talk about Climate Change, but we don’t do anything about it. We don’t drive less, our houses aren’t getting smaller, our furnaces and air conditioners don’t run less, we overfill our grocery carts with high fossil fuel foods, we prefer inexpensive imported products. So why don’t we do anything about Climate Change? Because we can’t. We must survive. Most of us can’t afford the expensive alternatives, and we fear anyone who would impose them upon us. We don’t want change, and the politicians know this. So true… and so depressing. Most of the Republican candidates scare me. 100,000 years? What are we in for? We need a miracle. We need change. We need a shake up. Now. What are your thoughts on the Occupy Wallstreet movement? I don’t know enough about it to have an informed opinion – midterms have largely prevented me from keeping up with the news! >A revenue-neutral carbon tax, which is offset by reductions in income taxes or paid back evenly to the public as a dividend, is one solution; a cap-and-trade program, which treats carbon emissions like a currency, is another. This is foolish unless you can explain how China and other developing countries will be forced to adopt this. I think the article is misleading in suggesting that having one collection of countries which are not the majority of emissions adopting these policies will solve the problem. For example from 2009 to 2010, China’s emissions INCREASED by 50% more than Canada’s TOTAL emissions. US is now 16% of world emissions, while China is just shy of 25%. India at 6%, increased by more than a third of Canada’s total emissions. Europe and the US had increases from 2009 to 2010 below the overall world increase of 6%. 3.6% for Europe, 4% for the US, 2% for Canada, and most of Europe’s gains came from Russia, Turkey, Kazakhstan, Ukraine, etc. A revenue-neutral carbon tax or a cap-and-trade scheme will allow a goevrnment to invest money in deployment of clean energy technologies, and thus reduce climate change, pollution, dependence on foreign resources, and income inequality all in one fell swoop. So why is this “foolish” again? > countries will be forced to adopt this. By taxing the carbon footprint of products at the border? Not a new idea. Yes I’ve seen that proposal, but it assumes a great deal about the size of the import markets vs export markets, and still leaves open the possibility of cheating. If it was a small country that was very dependent on imports, that would make sense. However, when you have the majority of emissions and population in these countries, their internal markets are very large. Any tariff would maybe influence things as a general sanction policy(not what you proposed), but still would not solve the problem. A revenue-neutral carbon tax or a cap-and-trade scheme will allow a government to invest money in deployment of clean energy technologies, and thus reduce climate change, pollution, dependence on foreign resources, and income inequality all in one fell swoop. So why is this “foolish” again? None of the above depends on China. still leaves open the possibility of cheating. If you were truly worried about people cheating to circumvent carbon pricing schemes — instead of merely using it as a handy talking point to dismiss carbon pricing — then you’d be striving to find ways to make carbon pricing more cheat-proof. None of this, however, changes the other central argument of Hansen’s book that we must get our governments to stop lying to us (and to themselves) that current policies (i.e. intending to burn all fossil fuels) will avoid disaster. They are doing this because they are caught between pro-fossil fuel lobbyists and anti-nuclear lobbyists who have ensured that, over the last 20 years or so we have pursued one and shunned the other – the complete opposite of what we should have been doing. Hansen’s solution (one of which I was actually already aware but was nonetheless surprised to find him asserting) solves our climate change problem, our energy crisis, and our radioactive waste legacy: Fast breeder reactor (FBR) programmes (cancelled in the UK and US in 1989 and 1994 respectively) should be re-instated because FBRs can be fuelled(1) by the 99% of the Earth’s uranium that thermal reactors cannot use; (2) by long-lived high-level radioactive (producing a much smaller volume of shorter-lived, less-radioactive waste products); and (3) by uranium extracted from seawater (where it is universally present at greater concentration than its average crustal abundance). Therefore, if you are asking yourself why FBR programmes were cancelled and/or why we are not pursuing this course of action already, the answer is it is not in the interests of the fossil fuel lobby for us to do so; and because of the success of anti-nuclear campaigners in the 1980s (who are still demonising nuclear power today). Martin Lack, I’m not opposed in principle to turning high-grade radioactive waste into lower-grade waste. However, digging up previously unused fissile material so that it can cause harm to people is a different matter. And we only need to look at Fukushima to see what happens when those hippie “anti-nuclear campaigners” don’t hold sway. The thing is, in many other fields, we willingly shell out time and money for certain things if we know (or if we think) they’ll make us safer and healthier. Home security systems; car seat belts; tooth brushes and toothpaste; these are just some of them. In the case of energy policy, however, this mode of thinking — quite a rational one indeed — has been distorted due to several factors. Solar power and wind power may be expensive at the moment, but they’re getting more and more cost-effective, and they’ll be even more competitive if we factor out the government subsidies given to fossil fuels and nuclear fuels. Most importantly, they’re as safe as safe can be. Ask yourself: will you willingly take the risk of breathing dirty air and drinking dirty water just so that you can save some money? If you check the statistics from the Royal Society for the Prevention of Accidents (RoSPA), you will find that more people have been killed trying to get dressed in the morning than have been killed as a result of nuclear accidents. Fukushima was a highly unusual event (i.e. the land physically dropped between earthquake and tsunami – resulting in over-topping of extremely well-designed defences). This does not mean that we should stop building nuclear power stations (apart from by the sea in earthquake-prone areas). Unfortunately, Germany et al have decided that this is exactly what it does mean and are therefore embarking on a return to coal-burning. Hansen believes that this, along with pursuance of all forms of unconventional oil and gas, means that it is Game Over for the avoidance of catastrophic change. And I for one believe that he knows what he is talking about. However, since I have degrees in Geology, Hydrogeology and now Environmental Politics, please don’t question me about pollution or money: I am not talking about saving money, I am talking about saving the planet. Even David MacKay accepts that we cannot do this using renewables alone (although that does not mean we should maximise their use – especially sensible things like tidal and solar power)… For the full story on the history of UK civil nulcear power (following on from where Hansen left off) – please read my blog today and tomorrow. Frank, a cap and trade scheme that does not include China will not reduce ‘climate change’ in a significant way. The development of clean technology that China would then be wanting to adopt will reduce global warming. However, I think cap and trade would make that less likely by locking in technologies that are not competitive. If they can make a profit because they are getting subsidies or their competitors are being taxed, then there is a reduced incentive to innovate. Only a clean energy solution that is cheaper or perhaps on par with coal will induce other countries to adopt it. MikeN, you’re essentially arguing that such and such a scheme proposed for the real world won’t work, because there may be a pie-in-the-sky solution which will work better if it actually exists. And no, I don’t buy that argument. Why don’t you propose a set of policy measures that governments can actually put in place now? Then we’ll see how it compares against cap-and-trade or a flat carbon price. What do you think? >because there may be a pie-in-the-sky solution which will work better if it actually exists. No I don’t know that there is such a solution. Only that the proposed solutions will not work. In other words, you’re just a naysayer with nothing constructive to add to the climate policy conversation. So, as Yoda might say: TFSU. To point out that certain climate policies will not lead to preventing global warming in any significant way is just being a naysayer and adds nothing constructive to the conversation? I think that shows why people mistrust climate science. The statement either is or isn’t true, and can be evaluated scientifically, but some people would rather not consider the question and just pursue the policy. For example, currently China is threatening to release a very potent GHG into the atmosphere unless they are paid to burn it. I’m not sure how much HFCs matter in terms of overall global warming percentage, but their global warming potential is measured in the tens of thousands. On the topic of climate change and young people: there seems to be a great many young people who say that they care about the environment, and yet they clearly don’t recognise the irony of their buying into the latest carbon-unfriendly technogizmos so they can electronically chat to their buddies about the fault being that of all the old geezers who didn’t change the system when they had a chance to do so.